Hi everyone! Welcome back for another episode from my by-monthly Yippee For Yana video series for Simon Says Stamp Blog! 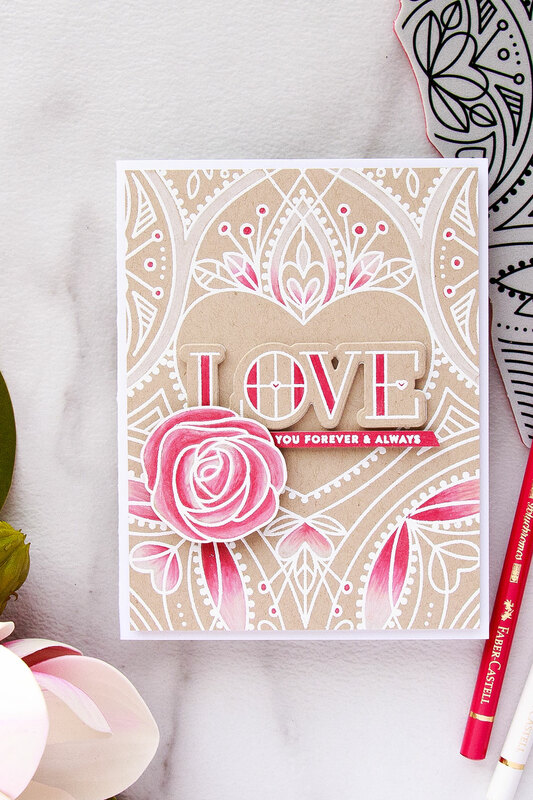 In today’s episode I’m sharing a delicate Love You card featuring selective pencil coloring. I’ve already showcased the technique I’m using for this card in one of my previous videos, be sure to watch it if you haven’t yet seen it. I am still very much fond of pencil coloring, so I decided to play with this technique once again and do some partial coloring. I started to work on my card by stamping a beautiful Center Cut Heart background stamp in watermark ink onto Neenah Desert Storm cardstock to have a faint impression on my paper, I wanted to heat emboss this background in white embossing powder, but I also wanted to color parts of this background with my colored pencils and to make it easier for me to color I first stamped the image using a stamp positioner tool, colored it while there was no embossing powder and later added embossing powder over the coloring. I was going for a very soft, feminine look and for my coloring I used just two pencils – White and Rose Carmine (these are Polychromos pencils). I’ve mentioned this many times in the past – I simply adore these pencils and I use them all the time. I have a smaller 36 set of pencils and in that set there’s only one hot pink an no lighter pink. When I color I like to have a light and a dark shade of one color to have nice gradual transitions. So I used white pencil instead and I blended the hot pink into a lighter pink and finally into white with the help of the white pencil only. I didn’t want to color the entire background as a), that would have taken too long, and b), this is not what I had in mind for this card. I wanted to have a lot of kraft, a lot of white and also hints of pink. What I love a lot about Polychromos pencils is that they are erasable in a way. You can take a regular pencil eraser and erase some of the color if you made a mistake. It’s a very cool and valuable quality of this product, I think. Sometimes I change my mind, or the coloring doesn’t look the way I want it to look or I’ve accidentally colored over something I wasn’t planning to color so I just use pencil eraser to correct my coloring. 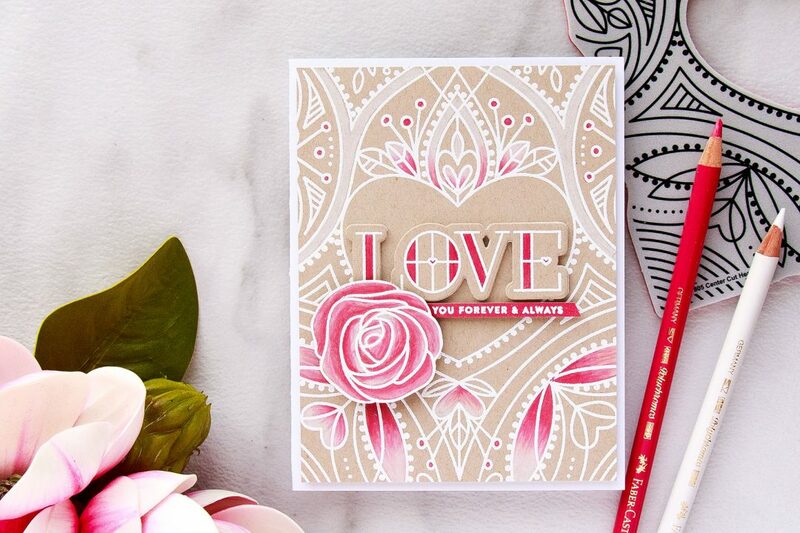 Once my coloring was done I heat embossed the background image in white embossing powder. I also created several additional elements for my card following the same technique. I used a rose image from the Best Mom Ever stamp set and also the word LOVE from the Stained Glass Love stamp set. I trimmed my background to 4 x 5 ¼”, foam mounted it onto an A2 side folding card base, foam mounted the word “Love” and also foam mounted the pencil colored rose. 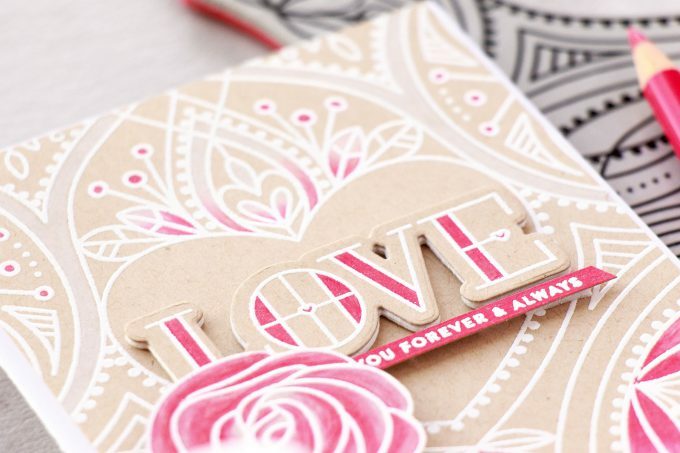 I wanted to add “You Forever & Always” part of the sentiment but I wanted to heat emboss it in white on pink. I didn’t have any pink cardstock that matched in color to the pink coloring, so I made my own little piece of pink paper by coloring a piece of kraft paper using my pencil. I always do this with my Copic markers and sometimes do this with my watercolors so why not do it with the pencils? Right? It matched perfectly, I heat embossed the sentiment and trimmed it into a skinny strip using my Tonic Trimmer, foam mounted onto the card. Lastly, I coated the flower using my Tonic Studios Aqua Shimmer pen and that finished my project. Beautiful card! I like the heart uncolored. This video is so timely … I was just wondering the other day if it were possible to heat emboss over colored pencil. Was going to give it a try and then you posted this video!!! Hope you had a good time at Creativation. Have been watching the videos on it. This is so beautiful Yana, I saw it over on SSS but wanted to tell you again. I think leaving the heart craft color was the right decision. That was beautiful! 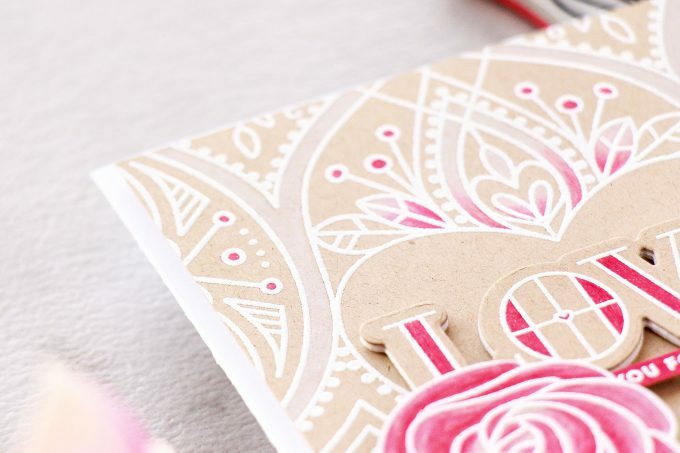 Such a beautiful card, with soft and lovely colors! Beautiful card! 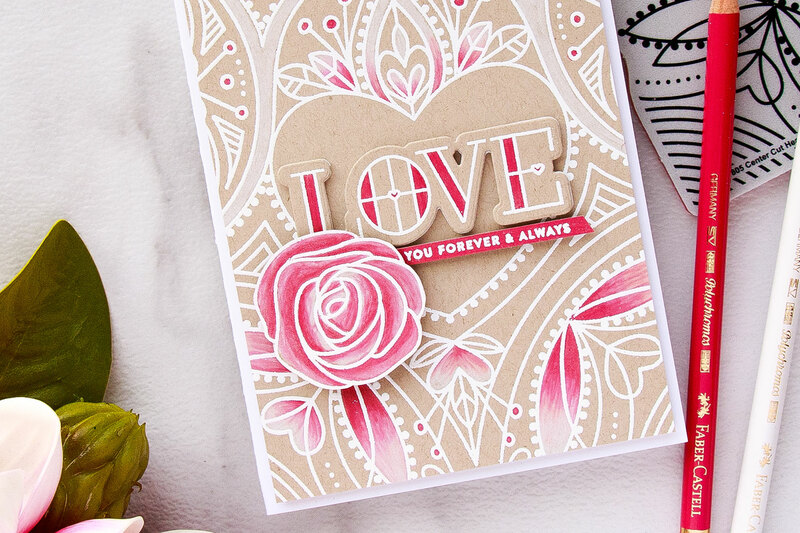 I love the splashes of color and with the kraft background. 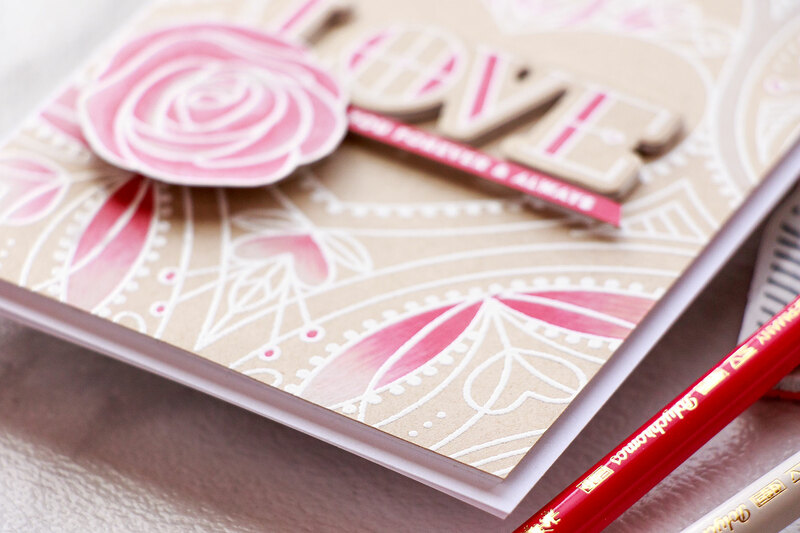 I agree that leaving the heart kraft colored was best. This is just gorgeous and so very feminine! Beautiful care. I love cards that are colored with pencils because as a beginner I have pencils and feel comfortable with them. I also appreciate the video. Absolutely beautiful card and your coloring was spot on! I love to see cards done with pencils. Beautiful card….thank you for sharing your creative designs and energy. Love this card, and also love the tips you shared in this video! Stamping once in watermark, then coloring, then re-stamping to heat emboss is SUCH a smart way to do it! Also a great idea to use your pencils to get the matching pink strip — seems so obvious once you showed it but I’d never have thought of it without your video. Thank you for sharing your excellent ideas! 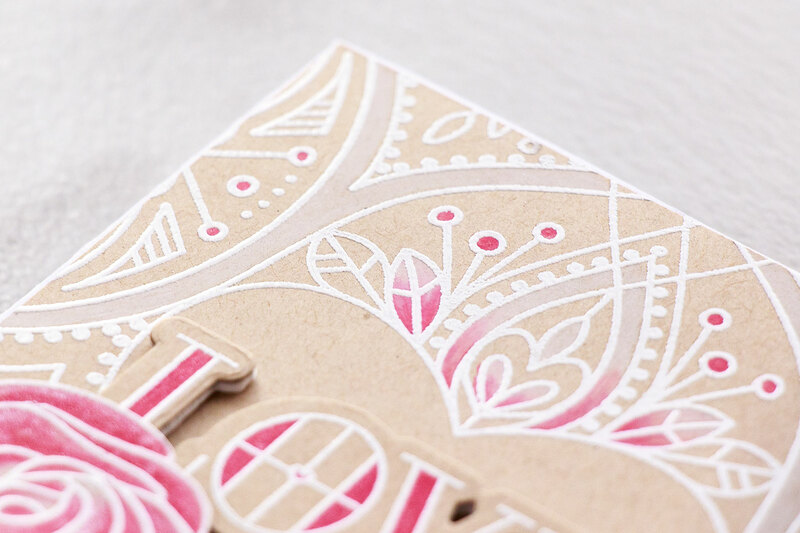 I would have never thought to do this color combo on kraft paper, but it looks stunning!